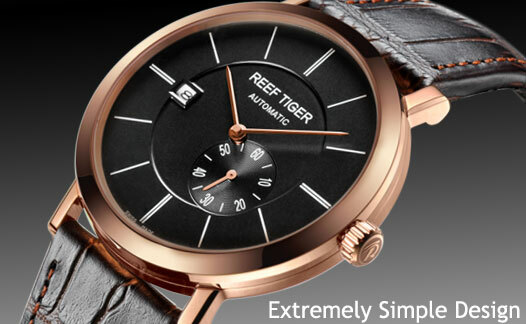 At first glance, this ultra-thin automatic watch is the perfect representative of simple and classic, it adheres the elegant and delicate tradition of Reef Tiger, is another nice work from Seattle. 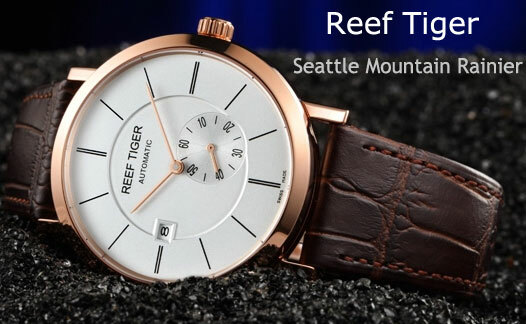 Rounded and beveled bezel is made of 316L stainless steel, 3-layered dial reflects advanced watchmaking technology of Reef Tiger, slender hour markers make the dial look more simple and elegant, in all, the design of Seattle Mountain Rainier is full of modern simplism style. Different from other general watches that set their date window at 3 o’clock, Mountain Rainier places it at 9 o’clock, which echoes with the position of small second hand and brings a wonderful sense of balance. The small second hand of Mountain Rainier is on the subdial between 4 and 5 o’clock, guilloche decoration with digits markers, it becomes a finishing touch of the overall design. The lugs design is simple and slender, straight lines replace the arched lugs design, but can fully fit your wrist and be well integrated with the straps, coupled with the case, the whole watch looks more slim. With ultra-thin pursuit, the side of Mountain Rainier perfectly shows exquisite watchmaking technology of Reef Tiger in a simple style. The crown, which is made of 316L stainless steel, is corroded first, and then is engraved with RT logo. 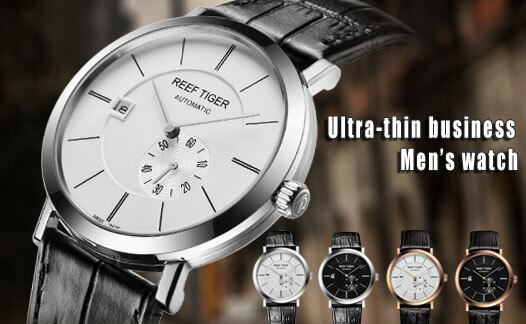 To achieve the ultra-thin design need, Mountain Rainier uses beveled cutting technology, there are four beveled design on the bezel, each bevel uses CNC carving, edges are clearly visible.